I am not sure that it is really accurate to call this a recipe. But I feel that it is my duty and responsibility to share this, whatever it is. A recipe, or a suggestion, or whatever, it is freaking delicious. Like maybe the ultimate snack or breakfast, or lunch. Personally I made this for myself for dinner a couple nights ago. But I will tell you what. These little “toasts” had the grilled cheese effect. The Martini effect. The Chocolate chip cookie effect. You don’t want just one. You want too many. Luckily, I only bought 4 ounces of smoked salmon, so that sort of took care of itself on it’s own. Only now I have smoked salmon on my grocery list for tomorrow. That good- please try it!!! Toast the baguette halves until golden brown. Drizzle a half teaspoon of olive oil over each piece of toast. Rub the crusty top of each piece of bread with the raw clove of garlic. Place half of each thinly sliced avocado on each baguette half. 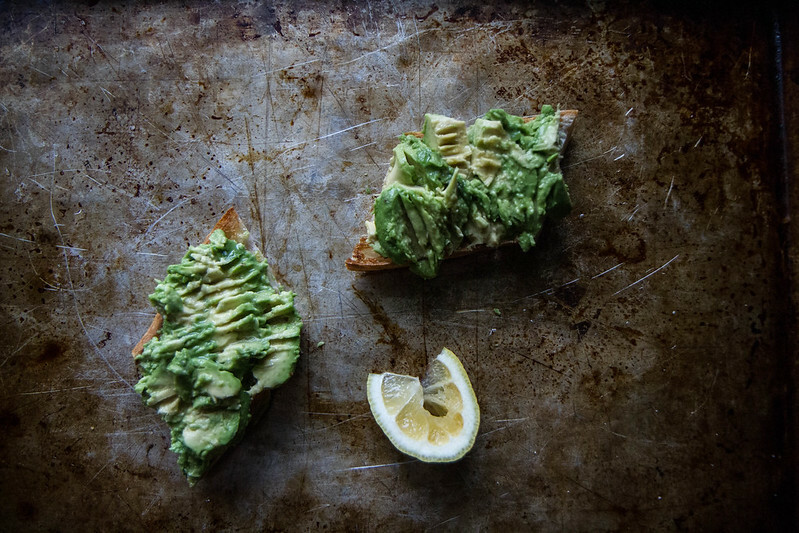 Sprinkle the avocado generously with salt and a squeeze of fresh lemon juice. Use a fork and smash the avocado directly into the baguette. 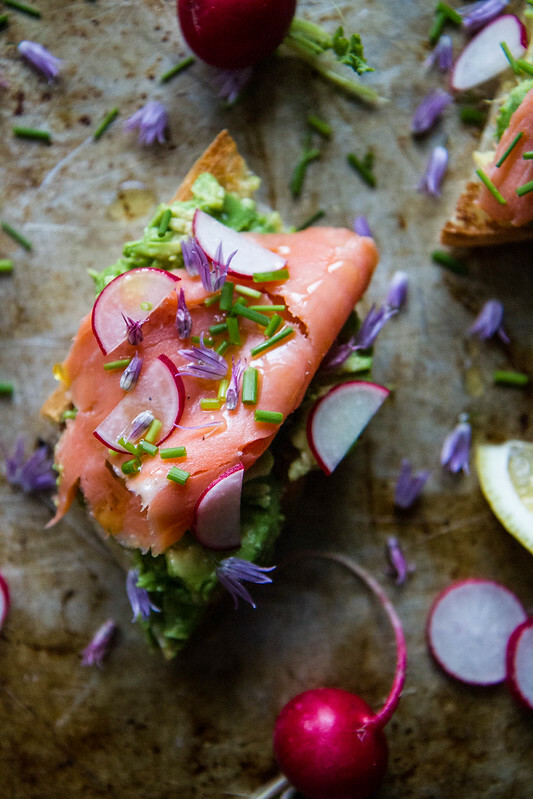 Top the smashed avocado with the smoked salmon, radish slices, a sprinkle of fresh chives and a half teaspoon of olive oil drizzled on top. Serve immediately. What a beautiful dish! Love this Heather!!! Yum is all I can say. 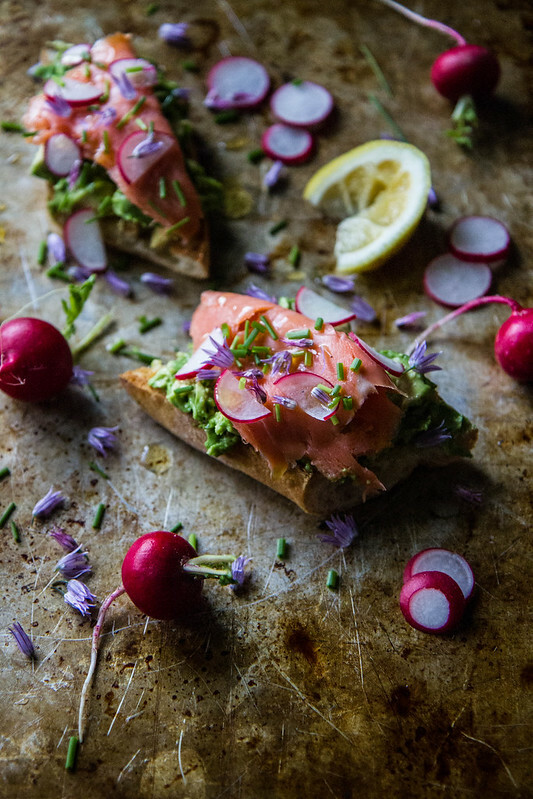 The radish is a slight twist that would give it a little welcome bite. So looking forward to trying this. Copper River Salmon cooked rare might also be terrific! OOOH! good idea! I have been wanting that copper river like crazy! I have all of these items in the frig and am going to eat this for lunch. The beauty of simple food! Totally Ruth! Hope you enjoy! One of my favorite breakfasts (being a CA girl) is smashed avocado on toast with scrambled egg whites & a lil yoke scrambled for flavor. I get weird looks for smashed avocado on toast, but hopefully it will start catching on! That sounds so good Colleen!!! This looks wonderful Heather! It will be dinner tonight or maybe I’ll add a poached egg and have it for breakfast! Gah!!! that sounds delicious Sheila! I ended up making it for dinner. Added a few baby greens from the garden on top of the avocado then garnished with crumbled pepper bacon. Delish! Dinner, all stacked up! I grilled a little Macrina Pane Francese for the base. Love this fancy avocado toast! I would eat this for dinner, or any meal! It looks so fantastic. And I have! Thanks Naomi! What a simple but super delicious treat! My family will love this! I haven’t tried or even seen the GF Olivia brand baguettes? Where do you buy them? The purple things – chive flowers?